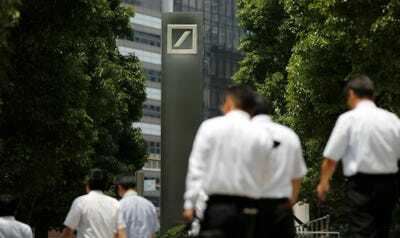 REUTERS/Toru HanaiMen walk near a logo of Deutsche Bank AG in Tokyo July 16, 2014. Germany’s flagship bank is in trouble. Some is of its own making. HAMLET, Shakespeare’s Danish prince, may blame “the slings and arrows of outrageous fortune” for his plight, but those watching often conclude that indecisiveness lies at the root of his troubles. Deutsche Bank, Germany’s biggest financial firm, faces lots of slings and arrows: a never-ending barrage of fines from American regulators, tough new rules on bank capital, a stagnant European economy and listless financial markets. Together, they have pummelled its prospects and punctured its share price. But the modern-day audience of investors, clients and policymakers are beginning to ask themselves whether Deutsche’s biggest problem is its failure to make difficult decisions. Deutsche’s story, thus far, is hardly a tragedy. But the bank is in an oddly fragile position. It is barely profitable, having earned only EUR681m ($US901m) last year on assets of EUR1.6 trillion–a return of just 0.04%. Its shares are priced at 0.6 times the value of its tangible net assets, half the level of American titans such as JPMorgan Chase and Goldman Sachs, to which it considers itself a potential rival (see chart 1). Investors, it seems, do not. It is Europe’s third-biggest bank by tangible assets, but only its thirteenth-biggest by market capitalisation. It is almost 25 years since Deutsche started its transformation from sleepy German lender to global investment-banking powerhouse. It got into the trading of bonds, currencies and commodities (known in the jargon as “FICC”) so that it could offer services such as the issuing of bonds or the hedging of foreign-exchange risks to its corporate clients, notably the midsized manufacturers of Germany’s Mittelstand. Plugging into global markets also gave Deutsche’s bankers the chance to speculate for the bank’s own account. In the go-go years such “prop trading” made profits fizz: Deutsche’s shares traded at twice the value of its tangible net assets. An outsized FICC business now seems like a liability, however. 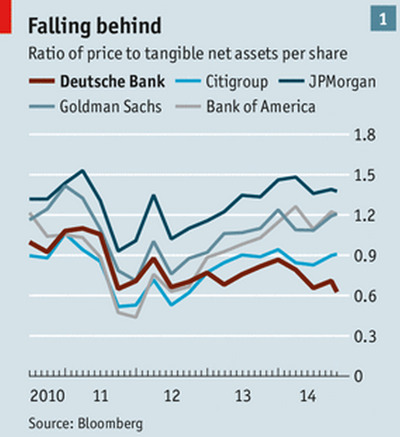 These days the higher the share of a bank’s income that comes from trading, the lower its share price. The industry’s profits from FICC are tumbling, from $US200 billion in 2009 to less than half that this year, according to the Boston Consulting Group, a consultancy. 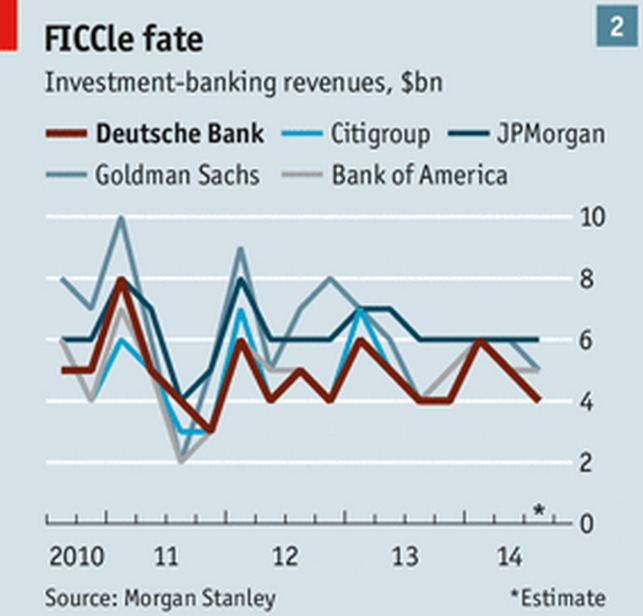 Other European banks such as UBS and (to some extent) Barclays are retreating from FICC. Deutsche, however, is sticking to the argument that a bank needs trading floors to serve corporate clients. Sentimentality may be a factor: Anshu Jain, the bank’s co-chief executive with Jürgen Fitschen since 2012, was for over a decade before that the principal architect of Deutsche’s push into FICC. The investment bank generated EUR14 billion of Deutsche’s EUR32 billion in revenues last year. But it is struggling. Having regularly claimed a spot as one of the world’s four biggest investment banks by revenue (alongside Goldman, Citigroup, Bank of America and JPMorgan), it has fallen short in every quarter for the past two years. Some of Deutsche’s problems are universal. Thanks to low and stable interest rates, markets for bonds and currencies have seesawed far less than usual. Such calm conditions deprive trading desks of business from clients rejigging their holdings. In Deutsche’s case these challenges are compounded by its heavy exposure to Europe’s faltering economy (around 70% of its nearly 100,000 employees are based there). Europe’s weakness has sapped its corporate clients’ demand for both loans and more esoteric financial products. Another shared woe is the sudden barrage of fines meted out to banks by regulators, notably in America. Deutsche has already paid $US4.5 billion and set aside a further $US4.1 billion to settle various lawsuits and investigations, according to Morgan Stanley, which expect $US5 billion more to be paid out by 2016. Much of the activity concerned happened on Mr Jain’s watch. Both Deutsche and Mr Fitschen personally also face legal troubles at home. 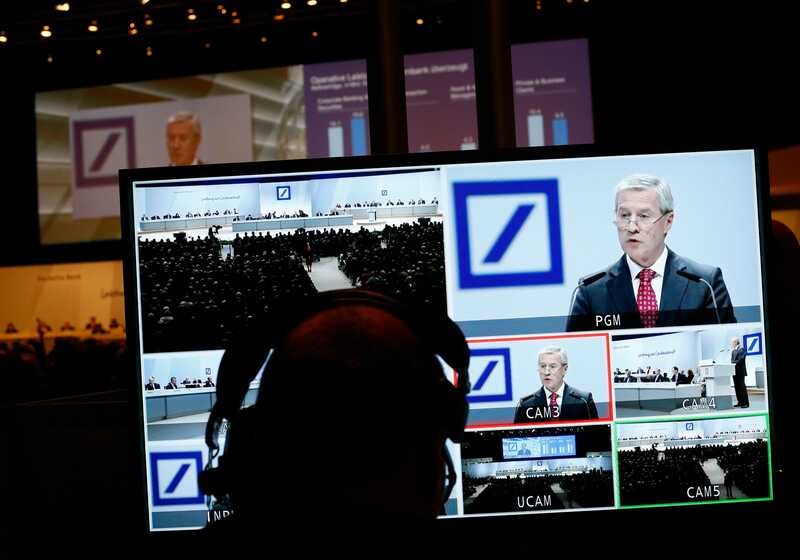 REUTERS/Ralph OrlowskiA technician watches a monitor showing Juergen Fitschen, Co-CEO of Deutsche Bank AG as he speaks during a shareholders meeting in Frankfurt May 23, 2013. The third big drag on global banks is the heavy burden of new regulation intended to avert future financial crises. They are now required to hold much more equity (the money shareholders have put into the business) and other loss-absorbing buffers relative to their assets (mainly loans and investments), by various different measures. Each of these has meant more costly funding for banks, especially “systemically important” ones such as Deutsche. The introduction of a blunt leverage ratio, which sets a minimum buffer banks must hold against assets irrespective of their perceived riskiness, is particularly taxing for European banks, which have long had bigger but more conservative holdings than American ones and have also raised less capital since the crisis. Deutsche puts its leverage ratio at 3.2%, just above the incoming minimum of 3%, which itself may well rise. American rivals do much better, and even by European standards Deutsche is lagging. Mr Jain admitted this week that “litigation, regulation, coping with all that has been more challenging than we thought”. Further provisions for fines drove the bank to a loss in the third quarter, although FICC did better thanks to more volatile markets. From next week, the task of supervising Deutsche will pass from BaFin, the German regulator, to the European Central Bank (ECB). BaFin has long been seen as a complaisant ally reluctant to hobble a national champion. The ECB is expected to be more demanding. Next year Deutsche will face additional scrutiny in America, too, as rules imposed on domestic lenders will be extended to big foreign banks. Regulators last year privately excoriated it for having “low quality, inaccurate and unreliable” reporting; they might limit payouts from its American unit to the German parent. Worse, the assault of new regulations has targeted FICC in particular. Prop trading is now banned or strictly curtailed in most places. Some lucrative activities, such as trading derivatives, are being forced onto exchanges, dramatically lowering margins (see chart 2). The rules about the sort and amount of capital needed to back a FICC business are especially exacting. By sticking with the bond traders, however, Deutsche is in effect betting that FICC’s troubles are mainly cyclical. That could be a reasonable wager. European policymakers, after all, have promised to foster capital markets, in particular asset-backed securities peddled by big investment banks. Plenty of politicians fret about having four American firms acting as sole gatekeepers to global markets. Moreover, Deutsche has few other options. Its retail business in Germany, which generated almost EUR10 billion in revenues last year, commands only an 11% share of a heavily fragmented, unionised market in which myriad state-backed rivals depress returns. Barclays, in contrast, has a lucrative domestic market to fall back on, plus a profitable credit-card operation. UBS is focusing on asset management, an historic strength. Deutsche tried to offload its asset-management arm as recently as 2012, although it has since invested heavily in it. Other businesses such as trade finance are reliably profitable but also weighed down by heavier regulation. 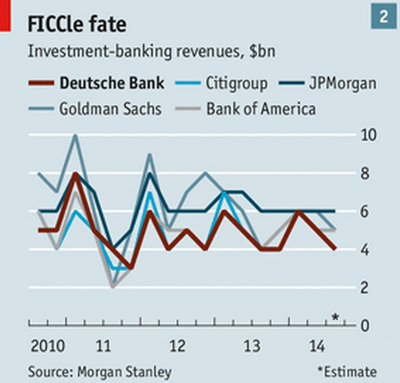 Yet competing in FICC requires scale: the big profits are made by the top two or three banks. Hefty investments in technology and compliance (Deutsche is spending $US1 billion in America alone, taking on 500 new staff) are in essence sunk costs more easily absorbed by the titans in the field. 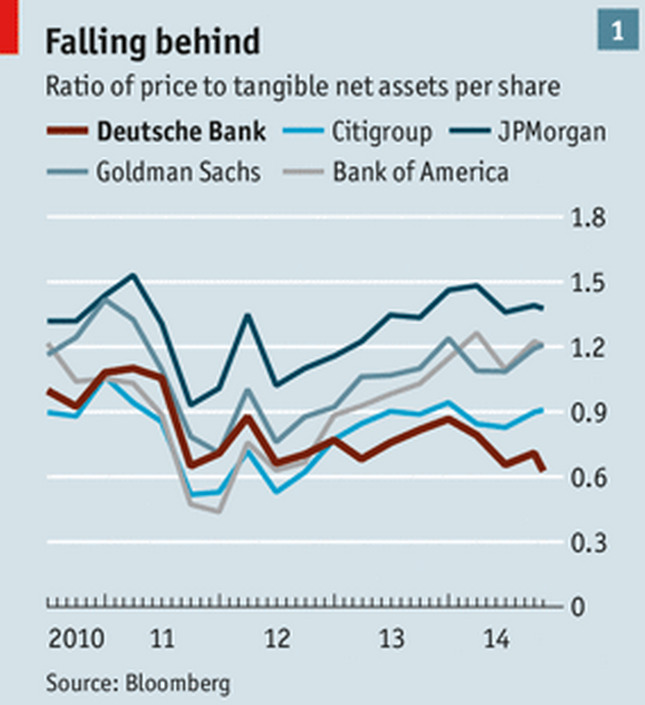 Deutsche’s relatively weak balance-sheet will limit such investments. Although it raised EUR8.5 billion of new equity in June, and EUR3 billion a year before, much of that will be absorbed by fines or higher costs, sending it back near minimum levels. Some question whether it will be able to continue paying its annual dividend of EUR0.75 a share, which was not fully covered by earnings of EUR0.67 per share last year–down from over EUR7 in the glory years. Its stronger American rivals, meanwhile, can offer cheap loans or credit lines to firms in the hope of winning investment-banking business from them, for example. Deutsche has diluted existing shareholders twice in two years by issuing new equity. Another round seems unlikely. “Anshu cannot raise capital and keep his job,” says one observer. Instead, Deutsche is improving capital ratios by shedding assets: at end-June it held around $US600m less than it did before the collapse of Lehman Brothers in 2008, a 27% drop. More cuts can always be found, its senior managers say. 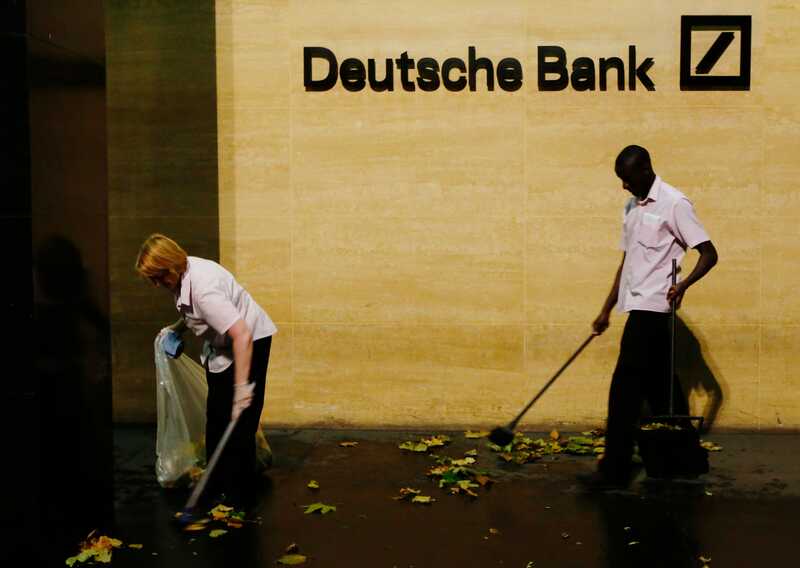 REUTERS/Luke MacGregorWorkers sweep leaves outside Deutsche Bank offices in London December 5, 2013. That has not been enough to allay concerns about its leverage (Barclays and Credit Suisse have gone further, trimming assets by 36% and 39% respectively), but it is also raising fears that Deutsche is harming the very businesses that it will need to escape from its rut. It has cut back drastically on the trading of Japanese shares, for example, and, like other banks, pulled out of commodities altogether. Some suggest a new model is emerging: taking more risk. They reckon Deutsche has started buying riskier investments (or issuing loans to riskier counterparties, such as property developers) to pep up profits. It has ramped up “junk” lending to companies backed by private-equity, one of the areas where it lost money in the 2008 crash. So far, Deutsche’s approach has not paid off. It is now the 36th biggest bank in the world by market capitalisation. All 35 above it bar one have delivered positive shareholder returns (taking in dividends and share-price movements) since the beginning of 2012. Deutsche has not. REUTERS/Kai PfaffenbachA statue is pictured in front of the former head quarters of Germany’s largest business bank, Deutsche Bank in Frankfurt, January 28, 2013. Nonetheless, it is just possible that there might be a happy ending. If regulators stop tightening the ratchet on profits through ever more stringent capital requirements, for example, and markets turn in its favour, Deutsche might thrive. Profits could reach around EUR6 billion a year as early as 2016, analysts reckon, close to the glory years pre-2007. Even muddling through could see its shares trade closer to net asset value. 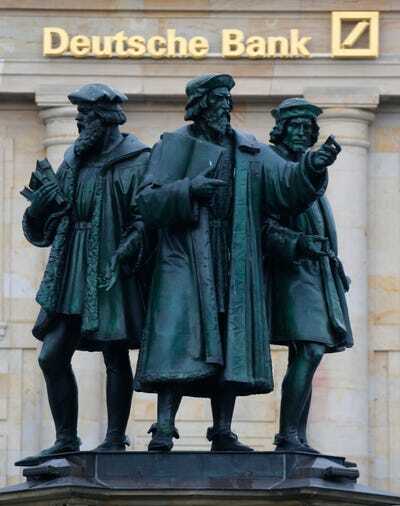 But many German banks–Dresdner, Commerzbank, WestLB and others–have briefly built themselves into a global force in investment banking, only to retreat again. If events continue on their current trajectory, Deutsche’s strategy of being neither out of FICC nor quite able to compete with the biggest banks could lead to a similar outcome. With capital tight, but with the current management unable to raise more, further cuts loom. Like Hamlet, it may eventually succumb to its wounds.